K-9 Police Officer Ire (pronounced Ῑ-rē) began her career with the Kill Devil Hills Police Department in September 2008. Ire had specialized training in the detection of illegal narcotics, evidence and property recover, tracking of suspects and missing persons, apprehension of suspects, and obedience. Ire was nationally certified with the North American Police Work Dog Association (NAPWDA) and the American Work Dog Association (AWDA). During her career, she performed a number of vehicle and residential narcotic searches. Ire successfully found a large amount of narcotics (marijuana, cocaine, heroin, and methamphetamine) during her career. Ire also had several tracks and successes in recovering evidence. Ire performed demonstrations at special events, including National Night Out and Red Ribbon Week at the schools. 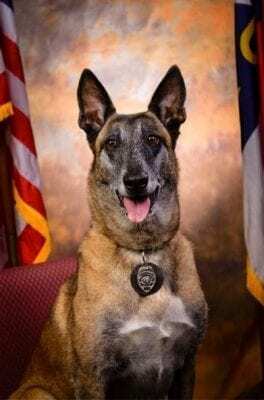 She had a very successful career with the Police Department, and retired in December 2013 due to a torn ACL in her back right leg. She had been enjoying her retirement with her former handler Police Sgt. Lee Twiddy until her unexpected passing on March 5, 2019.